For many years I’ve followed Roselle’s blog which has included her annual pilgrimage to Iona. There are a number of reasons why I wanted/needed this time out; they included being attracted to a place, some distance from home, and what I knew about Iona itself – an island on the edge of the world where Columba had landed. What I was looking for was peace: peace from the demands of my own expectations. A Time for Peace having been published, many new opportunities and responsibilities threatened to overwhelm me. How was I to fit these into the rest of my writing, what mattered and what didn’t? Luckily I appreciate and depend on P’s love and that of my family so I could spend a week on retreat with the confidence that the time was my own. On my first walk to the north coast I discovered where sheep grazed, highland cattle cared for their calves and the Youth Hostel provided a bothie. The structure to the week was similar to that on other writing courses I’ve been on. Morning: tutor input; Afternoon: writing/reflection and an hour just before the evening meal an opportunity to share what we’d been working on that day; Evening: listening to polished pieces of work, not all of it our own. 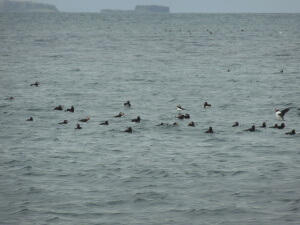 One afternoon I went to the island of Staffa where I saw seals basking on rocks and puffins rafting. 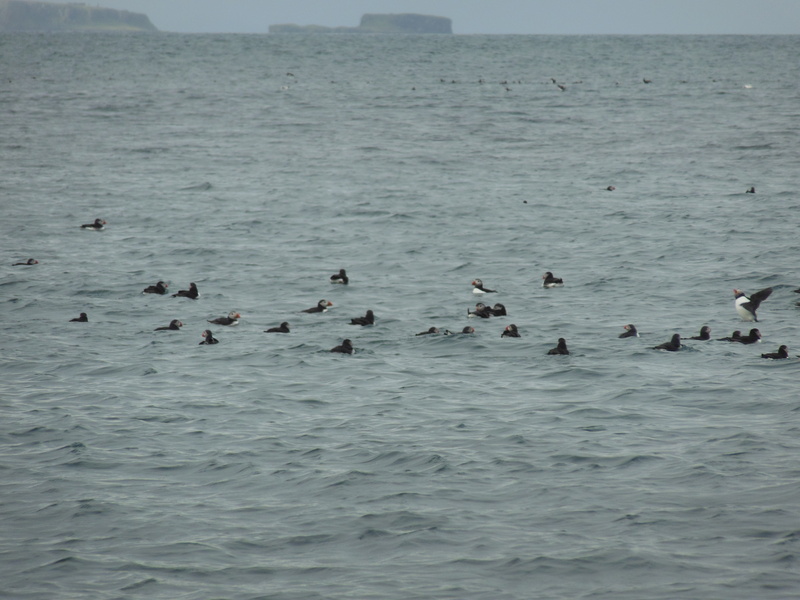 I didn’t expect to photograph puffins rafting on the sea on the edge of Staffa. I missed the one spotted by Anja, but saw over 200 after that. Utterly beautiful. I was too much of a wimp to walk along the cliff path to Fingel’s cave though others managed it and enjoyed it. 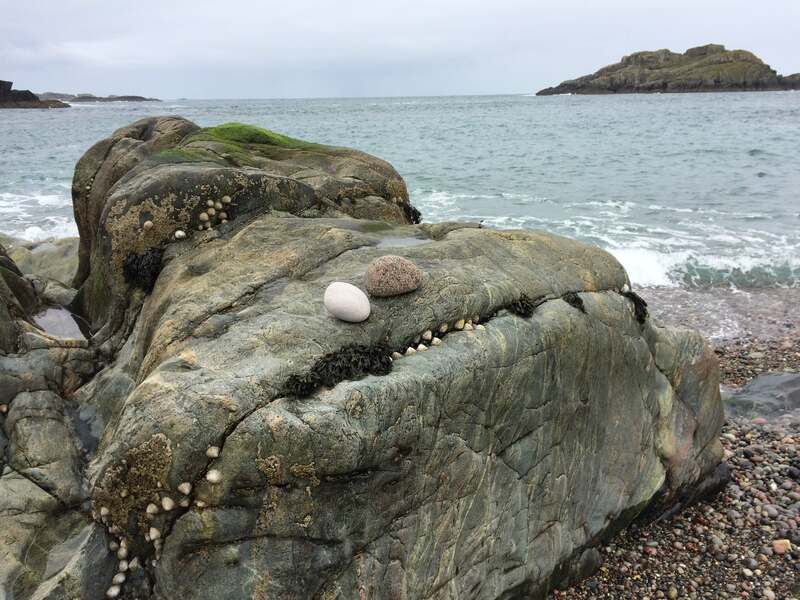 On Friday, we all walked to Columba’s Bay, discovered stones and rocks 2.9 billion years old. I still can’t get my head round that. Because I find it difficult to squeeze writing poetry into my working week, I decided that poetry would be my preferred genre. Roselle is an experienced and inspiring group leader and I wanted also to make the most of her skills. The reflective aspect of the retreat gave me time to think about why I want to write. I wrote one or two poems which were personal discoveries or explorations, useful but not for publication. The five poems I’ve completed I like; only time will tell whether they have meaning outside the retreat, beyond Iona. 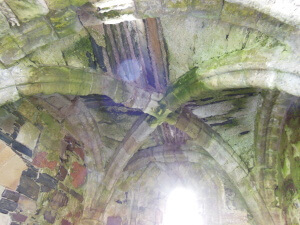 The vaulted roof of the chantry in the 12th century nunnery. We spent a morning in the ruins writing. Afterwards a much needed soup from the Heritage centre cafe. I was apprehensive about the course. 13 other participants seemed a large group and I worried that I wouldn’t get on with everyone, especially with those who’d been before and knew what they were doing. Roselle prepared us all for a broad range of experiences and encouraged us to be open to that as individuals and as a group. I worried I would be homesick; I was and survived. I was anxious that I wouldn’t be able to write, and I could. One afternoon I was disappointed that the weather was so wet and windy I couldn’t climb and explore Dun I, so I returned to my hotel room where I struggled and completed a poem I needed to work on and finish. Three ‘best bits’. The beauty of our voices singing in the candlelight chapel. My voice, though un-used to singing, soared with those of the other women with whom I’d become friends in so short a time. Roselle’s generous reading from her novels and poems. She wanted to read poetry; we persuaded her to read more from her novels than she’d intended. 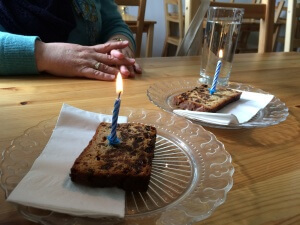 And laughter, particularly during the final Ceilidh but especially with Irene over our birthday candles in the Heritage cafe. I unpack. I type up my poems to be re-considered in a few weeks time. I write another chapter of my novel, start to read new books, ask myself more questions, have fresh doubts. ‘There is nothing new under the sun.’ It says in Ecclesiastes. On Iona I discovered, rediscovered, a little more deeply, who I am. A speck in time when compared to the rocks and stones on Columba Bay; a poet, writer, person of significance nonetheless. This sounds like a wonderful inspirational writing retreat. What an experience. I need a week like that – just to get away and have time to think about writing and not be distracted by the rest of my life. I enjoyed your blog – it’s good to put writing first for a change! It tends to get pushed back to the bottom of my to do list. Roselle sounds like an inspirational leader too. 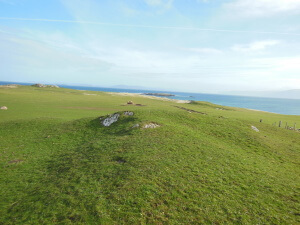 And Iona must be a such an experience, an amazing place to stay and find ideas for writing. I hope you get your week soon, Cathy! Thank you, Alexandra. I hope your writing is going well. Marg – lovely to read this and be transported back to a magical week, a magical time. Your voice is still so clear to me. It was a magical week. I return in my imagination so often. 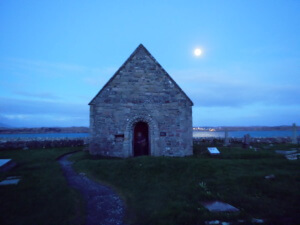 Marg, I loved reading this account of the time in Iona this year. It has brought back so much of that that wonderful week. So glad that Roselle sent the link. Amazing also to see that photo of the April birthday cake candles from the Heritage café ! What a great time we all had. It is lovely to read everyone’s poems from that week in the Iona Anthology too. Have I ever said how lovely this is? And I really like your photo of the vaulted roof in the Nunnery. So glad you’re coming back, Marg.